Place the anchos and stock in a saucepan over medium heat. Bring to a low boil, then simmer over low heat to reconstitute. Heat 1 tablespoon EVOO in a large Dutch ovenor large, deep skillet over medium-high heat. Add the bacon and brown for a few minutes, then remove to a plate with a slotted spoon. Add the ground turkey and brown and crumble the meat; season with salt and pepper. Add the onion, garlic, chipotle in adobo, paprika, cumin, coriander, cocoa powder and cinnamon. Stir and cook to soften, 10 minutes more. Add the tomato paste and stir for 1 minute. Deglaze the pan with the beer. Add the ancho puree to the chili along with the reserved bacon. Simmer over low heat to thicken, 20-30 minutes. Cool and store for a make-ahead meal. To reheat, reheat over a medium flame on the stovetop, stirring occasionally. Serve with the garnishes of your choice. In Recipes-list.com we have selected the most viewed recipes from category - uncategorized . Enjoy the best recipes specially selected for you! 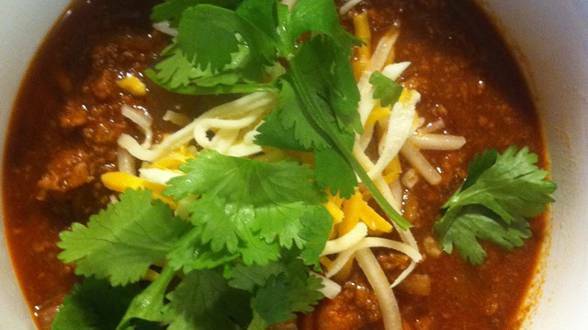 Ancho-Chipotle Turkey Chili is the right choice that will satisfy all your claims.